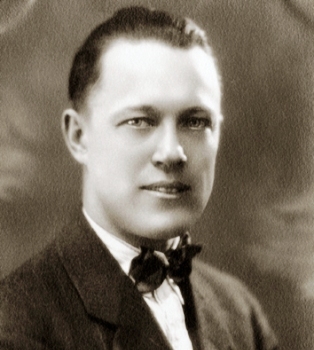 Known as “K.D.” Ross, he was largely responsible for the 1925 launch of WOWO in Fort Wayne. As a salesman at Main Auto Supply, which also was a jobber of radio sets, he convinced the owners to build a station on the store’s second floor. When the 500 watter was fired up they were astounded to hear from 40 states and 9 Canadian provinces. Ross later was to recall that it proved to be a powerful tool to sale of Day Fan radio sets. “Many a time a dealer would call saying he was making a demonstration at Mr. So and So’s home and we would start up the station. We would play several records and make an announcement, and if we included the customer’s name it generally ended up in a sale.” He eventually opened his own business, Ross Radio (& TV) which he operated for many years. Ross died in Fort Wayne in 1987 at age 89.